What If March Madness Was Formatted Like the World Cup? March Madness is the most chaotic sporting event on the calendar each year. The unpredictability of the tournament makes for exciting viewing, but it means the result is often less than perfect. With top teams able to be bounced from contention with a cold shooting night or buzzer-beating defeat, the best team doesn’t always win it all, with hot teams, rather than the best, reaching the Final Four. The World Cup format provides a buffer zone for the best teams by beginning with group play. There’s still a chance for upset wins or shocking results, yet a true Cinderella needs to sustain their level of play for more than just one game. This year, the soccer world was abuzz as Germany failed to reach the knockout round for the first time EVER. All the Germans needed was a draw versus a solid, but pedestrian South Korea side and they couldn’t manage even that. My Soccer Friend Dennis (everyone has a Soccer Friend) compared it to top seed in March losing to an 8 or 9 seed in terms of shock value. That happens all the time, but Germany had two games prior to the Korea loss to earn their way past the group stage. The Germans also lost to Mexico, sealing their fate. If Virginia had two more games to survive after losing to UMBC, the upset would mean far less, but would it have been less exciting? Would Virginia have been able to bounce back and advance? Those are the kinds of questions we’re going to try to answer here today, by taking the field of the 2018 NCAA Tournament and imposing the World Cup draw and tournament format. For those unfamiliar, it’s somewhat simple to explain. Teams qualify in their respective regional tournaments, just like college basketball teams in their conferences. FIFA then draws the qualifying countries from a series of pots based on their region. For a basketball example, it would be like picking one team from the ACC, one from the Big XII, one from the Big East, and one from the Pac-12 for each group. That process doesn’t exactly work for college basketball, though. FIFA has only five regions. College basketball has 32 conferences. Instead, for our purposes as we try to recreate a World Cup like situation, let’s use the seeds already awarded by the NCAA Selection Committee as our pots. 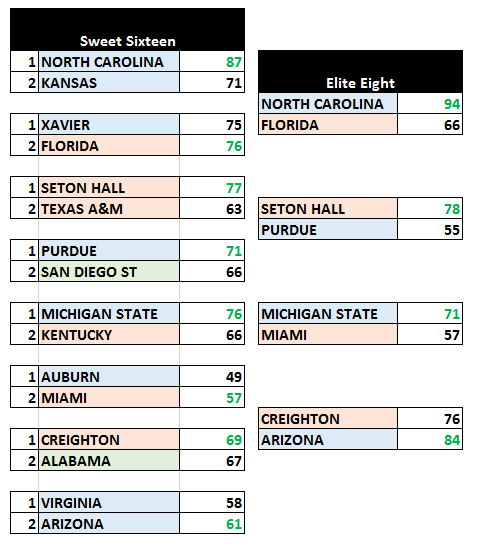 The top 16 seeds make up the first pot, with the next 16 in the second pot, the next 16 in the third, and the bottom 16 in the fourth (with the teams that lost in the First Four in Dayton not invited for numbers sake). This way, each of the top 16 seeds could end up in a group with a team as good as Kentucky or West Virginia, or feel safely paired with a team like Missouri. Why doesn’t top seeded Virginia automatically get placed with the bottom team from the next pot? Because soccer is insane and the randomness makes up for the possibility of human error in the seeding process. If this already bothers you, the rest of this post may not be for you! Each group will have a team that was seeded 1-4, 5-8, 9-12, and 13-16. This could potentially lead to what soccer fans call a GROUP OF DEATH, with teams seeded 1, 5, 9, and 13 all playing for two spots to advance. This would be wildly unfair and buckets of fun. First Round: On-campus games either Wednesday-Friday-Sunday or Thursday-Saturday-Monday. Yes, this is even more than the usual tournament weekends. That’s a good thing. Second Round: Same schedule as above, but in regional cities, just like the first two rounds are now. Knockout round: Now it’s just the Sweet Sixteen as usual. Four cities, four teams per city. Final Four and National Championship are just as lovely as they are now. If you’re lost, stick with me. It will make sense in action. Oh, and we aren’t making any special rules about teams from the same conference being in the same group. Let’s get nuts. GROUP OF DEATH ALERT: Remember how UMBC and Loyola-Chicago were the darlings of March and thrilled fans across the nation? They are stuck not only in the same group, but in a group with North Carolina and Kentucky! Only two of those teams will even advance to our second draw. While that may be less fun in a basketball sense, that draw result is already 400 million times more exciting than whatever the hell happened with Greg Gumbel and Ernie Johnson this year. Group 4 look familiar? Three of those teams were in the same pod of the NCAA Tournament, playing in Pittsburgh. Radford lost to Villanova, Alabama beat Virginia Tech and Villanova beat the Tide to reach the Sweet Sixteen. Those three teams breathe a sigh of relief drawing Xavier here instead. Marquee games are everywhere. For those of you thinking this first round lost meaning with this format, can I interest you in some of the games that will happen here? Carolina-Kentucky, Michigan-West Virginia, and Ohio State-Duke (at Cameron) are worth the price of admission, with fun stylistic and rivarly situations happening in Kansas-Butler, Xavier-Alabama, Purdue-Creighton, Cincinnati-Miami, Tennessee-Florida, Texas Tech-Texas, Gonzaga-Clemson, Houston-Wichita State- and Michigan State-Marshall. Possible Cinderellas pop up all over. Penn no longer needs to beat mighty Kansas, instead tasked with three super inconsistent teams. Bucknell, Iona, Murray State, and St. Bonaventure have to like their draw here more than in real life. Now, here’s where we get wild. When I pitched this idea to some people, they assumed that this is where the experiment stopped. That’s no fun! We need to Google the phrase “college basketball simulator”, find one that seems effective, and then play out this tournament! Every team that went 2-1 or better advanced, with one exception. Nevada, in Group 13, won twice in narrow fashion, but lost to Syracuse. The Orange and Auburn also won twice, finishing with a better point differential. For this to happen in just one of 16 groups is pretty satisfying, especially since we’re comparing to soccer, which features draws and a point system. I can already imagine Dickie V and Jay Bilas screaming about how unfair this system is to Nevada, but hey, they should have beaten Penn by more than six points. Upsets still exist! Even with the safety of group play, the top two teams in every group did not cakewalk to the next round. Two teams in the top pot failed to reach the next round: Gonzaga and Duke. Five more teams from the second pot failed to advance. Only one team from our bottom feeders survived, with Cal State Fullerton earning a trip to the next round by beating Duke (at Duke!) in what would go down as an all-time great tourney win. The sim isn’t truly chaotic like March Madness, but it’s worth trusting. Bad teams struggled and the best teams generally did just fine. VIllanova was undefeated with the best point differential. I think this round went well enough to sim some more. GROUP OF DEATH ALERT: Thanks to a first round loss by Virginia (sounds familiar!) and Kansas, those top teams were drawn from our second pot in this draw. That led to a stacked group alongside Wichita State and Texas Tech. Those four teams were initially among the top 16 original seeds, but just two will reach the knockout round. Fun! Softer groups appear to lead to easy advances. The top team in Group 7 is Florida, who was a 3-seed in real life (as was Houston). Over in Group 3, just one team reached the Sweet Sixteen in reality. Meanwhile, Alabama and Texas luck into each other, rather than one of the more stacked pools. Gasp! Villanova is out! Faced with a tough pool, the Wildcats will not be our fictional champions. They managed to beat Butler, their Big East foe and one of the few teams to knock them off this season. It was the rest of the pool that proved too difficult. Purdue, armed with a healthy Isaac Haas, and Kentucky nipped Villanova to send them home. If you’re looking for parallels to the World Cup, Villanova is our Germany. Or maybe Duke was. I don’t know. Only one group was decided by tiebreaker! That’s pretty encouraging. Just 2 out of 24 total groups needed to be settled by point differential. In terms of fairness, that’s a good sign. This time, rather than three teams tied at 2-1 fighting for two spots, we had three teams at the bottom of a group tied at 1-2. Alabama moves on by just one point, but beat Texas, the team they nearly tied, head-to-head (but lost to Ohio State, who Texas beat, and so on, in a circle). There are worst things than getting Collin Sexton into the Sweet Sixteen. We’ll live with it. The sim went far different than the actual tournament. Obviously this is just a thought experiment, but it is interesting to see than just four teams from the real Sweet Sixteen are still alive here (Kansas, Texas A&M. Purdue, Kentucky). That speaks to the unpredictability of not just bracket play, but this format as well. Michigan State should join the SEC. Sparty made quick work of its Southern foes, with an undefeated second round. Let’s simulate the next weekend of play. Ok, things are getting weird. We lost all of our true Cinderella stories, with the entire Elite Eight coming from the top two original pots and power conferences. I started to worry than maybe the simulator was a little too favorable to the top teams. But then Seton Hall made the Final Four, so I stopped worrying about that. Some of these games are making me salivate. UNC and Kansas? Virginia and Arizona? Florida beats Xavier by 1? Creighton over Alabama by just a bucket? These look, feel, and sound like real tournament games. That’s all we can ask for. Wait, what? No, like, uh, what. What happened? I understood Arizona making a run, since the computer doesn’t know the team was embroiled in scandal and drama. I got why great teams like UNC and Michigan State were advancing. I do not understand how or why the simulator loved Seton Hall. It really, really loved them. The Pirates went 9-1 this Fictional March and cut down the nets as National Champions. I couldn’t be fake happier for these fake computer generated players. In conclusion, the World Cup format might not be as wild as a single elimination bracket, but it isn’t far off. This formatting change gave us more games, more basketball, more drama, and more random silliness. I can’t say it’s an improvement, especially in the one regard we expected it to be: choosing a worthy champion. Yet we still got chaos and madness, and that’s good enough for me. Shane McNichol is the founder, editor, and senior writer at PalestraBack.com. He has also contributed to ESPN.com, Rush The Court, SALTMoney.org, Larry Brown Sports, and USA Today Sports Weekly. Follow him on Twitter @OnTheShaneTrain.